This CD was produced with the kind support of the Australia Council for the Arts. So wrote Johann Nikolaus Forkel in his 1802 survey of Bach’s life and work, and so the belief has grown that Bach’s six sonatas for organ were conceived specifically as exercises to train independence of hands and feet for aspiring organists. Certainly they stand today as among the most challenging examples of this particular area of the organist’s skill and remain obligatory exercises for all organ students; it is widely acknowledged that once students can master these six trios with their complex counterpoint and wide variety of musical devices, they are fully equipped to meet just about any technical and musical challenges the organ repertoire can throw at them. But there is little solid evidence to support Forkel’s claim— although it does remain the most credible explanation for these extraordinary organ works—and probably it is best simply to admire the sheer beauty of Bach’s creation, and marvel at the way in which such beauty is achieved through absolute economy of means. In response, an anonymous author (although almost certainly it was another of Bach’s sons, Carl Philipp Emanuel) set out a detailed comparison of the two composers, referring along the way to ‘various trios for the organ’ by Bach and singling out the six sonatas as being ‘written in such galant style that they still sound very good and never grow old, but on the contrary will outlive all revolutions and fashions in music. All in all, no one has written so much beautiful music for the organ as J.S. Bach’. (To which, as a delightfully spiteful afterthought, he added: ‘Of the organ works of Handel, as compared with those of Bach, nothing can be said’.) Unfortunately, at the time the wider musical world only had C.P.E. 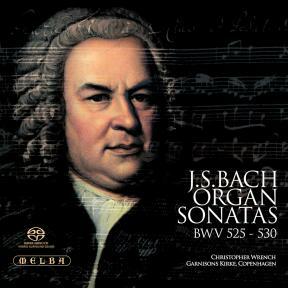 Bach’s word for it as the sonatas, like virtually everything else Bach had written for the organ, remained unpublished. Consequently, Burney’s opinion long held sway in England and it was not until the 1820s that a concerted effort was made, in the inimitable words of Samuel Wesley, to ‘bring the Musical World to Reason and Common Sense, and to extort a Confession of the true State of the Case against the Prepossession, Prejudice, Envy, and Ignorance of all Anti-Bachists’. One of Wesley’s greatest allies in this endeavour was Carl Friedrich Horn (1762–1830), a German-born organist who had settled in London. He possessed a large amount of Bach’s unpublished organ music and regularly presented it at ‘organ exhibitions’ that, according to one contemporary report, ‘began at eleven o’clock in the morning, lasted for four hours, and were attended by up to 5,000 persons’. Seeking finance to have Bach’s organ music published for the first time in England, Wesley drew attention to the ‘Stupendous Trios for Organ, which Mr Horn used to play thus: his right hand played the first part on the Top Row of the Clavier; his left the second Part on the second Row, and he played the Bass wholly upon the Pedals’. His appeal for funds to have the music published was successful, and the six sonatas appeared in print for the first time in 1827. We do not know what title (if any) Bach originally gave these six works which are unique in his entire organ output. The earliest surviving manuscript has lost its title page while each of the sonatas is merely headed Sonata à 2 Clav: et Pedal. In the English speaking world, at least, they are usually referred to as trio sonatas, although that term is more properly applied to the four-movement chamber works, usually for four players, which originated in Italy in the early 17th century and reached its apogee in the trio sonatas of Arcangelo Corelli. In the mid-1680s Georg Muffat returned to his post as organist and chamber musician to the court at Salzburg after a period of study in Rome with Corelli, and thus the trio sonatae the music published was introduced to northern Europe and eventually found its way to Bach. He only ever wrote one true trio sonata in the Corelli mould—in the Musical Offering—but since he invariably used the term ‘sonata’ to imply music of Italian style, it seems reasonable to infer that, despite the fact that all except one (BWV 528) follow a three-movement fast-slow-fast pattern, and all are for a single player, these works are, at the very least, inspired by Corelli’s models. The sonatas first came to the attention of the wider musical world when Georg Poelchau (1773–1836), a Berlin-based collector of musical manuscripts and early printed editions, bought the manuscript from C.P.E. Bach’s estate in 1790. Although it was a complete manuscript (minus title page) of all six sonatas, and from analysis of the paper it is shown to date from 1730 when Bach was, indeed, at his ‘most mature age’, Walter Emery noted in 1957 that it was ‘a compilation based partly on earlier material’. In fact it seems that only one of the sonatas—No. 6 in G major, BWV 530—was originally conceived in its entirety for the organ. The others are made up of either arrangements or transcriptions of individual movements from earlier works and, since the sequence of keys in which the sonatas appear makes no logical sense, it seems reasonable to assume that they were compiled at different times possibly, as Peter Williams has suggested, ‘over the period in which [Wilhelm Friedemann] was learning the organ’. Weight is given to the argument that they were originally intended for his eldest son by the fact that another valuable manuscript source, thought to date from between 1730 and 1733, appears in Wilhelm Friedemann’s own hand (alongside that of Bach’s second wife, Anna Magdalena). Possibly he had made his own copy to take with him as he embarked upon his career as an organist, a career which started with his appointment at the Sophienkirche in Dresden in 1733. Of the 18 individual movements in the six sonatas, only one does not carry a tempo marking, the bubbling canon between the two upper voices over a happily skipping pedal line which opens No. 1 in E fl at major, BWV 525. This movement is known to have begun life some years before it appeared in this context, but only a fragment of an earlier manuscript exists. The final movement of this sonata is notable for the equality between the three parts, the pedals frequently taking on the very violin-like writing with its diminishing upward leaps first heard in the right hand. The central movement is more in the form of a richly decorated siciliano with a gently swaying pedal line. Although Bach’s music was little known outside northern Germany at the end of the 18th century, Mozart knew the organ sonatas. In 1782 he produced 6 Preludes and Fugues for String Trio, K404a which included the second and third movements of Sonata No. 2 in C minor, BWV 526. The second movement, with its richly lyrical character, the long-held notes in one voice against gracefully fl uttering ones of the other, clearly appealed to Mozart’s operatic side, while he was so taken by the grandeur of the final movement’s contrapuntal complexity that he altered the original Allegro tempo marking to Moderato. The sonata’s Vivace first movement opens with a lively figure in thirds that soon breaks into a passage of ingenious imitative counterpoint. It is by no means certain that the published sequence of the six sonatas—and the sequence in which Christopher Wrench performs them on this disc—mirrors the chronology of their composition. Some sources suggest that No. 3 in D minor, BWV 527 is actually the earliest of the set. The first movement, unusually marked Andante, could possibly date from 1722 while the final Vivace probably belongs to the same period. The origins of the second movement are unclear, but Bach later reused it as the slow movement of his Triple Concerto (for fl ute, violin and keyboard) while, later still, Mozart turned it into the fourth Prelude of his K404a. However, the earliest individual movements are to be found in Sonata No. 4 in E minor, BWV 528, which is the only one of the six to follow the pattern of Corelli’s trio sonatas by opening with a slow introduction. The entire first movement began life as part of the Sinfonia to Cantata No. 76 ‘Die Himmel erzählen die Ehre Gottes’ composed for 6 June 1723 and scored for oboe d’amore, viola da gamba and continuo, while the middle movement also exists in earlier versions, one dating as far back as Bach’s years in Weimar (1708–17). Evidence points to the final movement as having originally been intended as the middle movement of the Prelude and Fugue in G major, BWV 541. The second movement of No. 5 in C major, BWV 529 also originally appeared as the middle movement of an earlier prelude and fugue, the Prelude and Fugue in C major, BWV 545, while the outer movements appear to be originally conceived for this particular sonata. The closing Allegro, however, seems tailor-made for the conventional ensemble of Corelli’s trio sonatas. The only sonata entirely conceived in the guise in which it here stands is No. 6 in G major, BWV 530. The lively Vivace has the two upper voices chasing each other around above a happily striding pedal with the influence of Vivaldi, whose music exerted a strong fascination over Bach, particularly evident in the concerto-like nature of this movement. After a somewhat plaintive and intimate Lente, the closing Allegro is a typically complex Bachian piece of fugal writing between the two upper voices above an energetic pedal line.